Sue Bowen is a retired primary school headteacher and school inspector, still involved in schools as chair of a local Multi Academy Trust. She lives in Macclesfield and has two children and four lovely grandchildren. Walter Herbert Bowen, known as Bert, starts to keep a diary at the age of 14 in January 1914. The early entries in his Boy Scouts Diary show his preoccupations with scouting, riding his bike and visiting friends and relatives. In the build-up to World War I his entries start to reflect the news Bert gathers from the newspapers and the growing tensions in Europe. Along with many other young men he is stirred by the thought of fighting for his country. This, added to the difficult situation in his home, leads him to lying about his age and enlisting early. After Bert’s first tour of duty in France he is brought home to await his eighteenth birthday. 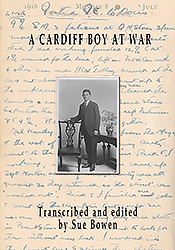 He finds work to fill this gap in Cardiff, during which time he falls in love for the first time. On attaining the age of eighteen he enlists again and is sent to Devonport and then Porton, where highly secretive experiments are taking place in the use of chemical warfare. Bert serves a second term in the Somme area of France, carrying essential weapons to the front and securing guns in their emplacements. He witnesses the fighting first hand including the men going “over the top”.